On Sunday, the 5th October the car drive took just one hour to Escourt. The MahaGayatri temple, there, was tastefully decorated for the sixth night of Navaratri festival. 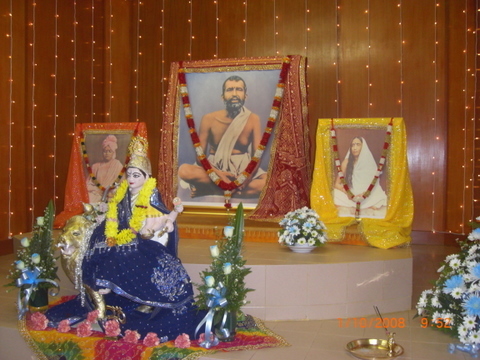 The devotees of Estcourt included devotees of other Hindu organisations as well like Divine Life Society, Satya Sai Sangh etc . With common prayers the function started that included my sixth night Talks. Here I spoke on ‘Devi and Her Splendour’. The devotees would not let me go after supper as they all sat with me in the adjoining hall where till eleven past interesting discussions took place. From Estcourt I reached Pietermaritzburg by midnight. How I wished the next day would go off quietly with sufficient rest! But Mother had other plans, it seemed. The almost continuous incoming telephonic or otherwise messages on the sixth October did not allow me to forget my birthday, which I badly wanted. And when the evening came, I was taken to Pietermaritzburg centre. The program on the seventh night pleasantly included, among the set pattern, extra two items of dance on the bharatanatyam style by two school girls who performed exceptionally well. Here being the seventh night of Navaratri which was inter alia the first night of worship of Mother Saraswati, I dwelt upon Mother Sarada as the embodiment and imparter of knowledge. Next day, by seven in the morning I was back at HQ. At Nischalananda Hall arrangements for Chandi yajna or Durga Hawan have been made in a huge scale. The chanting of entire scripture of Durga Saptashati was done followed by hawan with the mantra – ‘Aum Aim Hrim Klim Chaamundaayai Vichhe’ which was joined by all the assembled devotees. Cooked prasad was distributed thereafter. On the same eighth night, to a packed audience at the Ramakrishna Temple I spoke on the Devi Mahatmyam. Especially the meaning of ‘Aim, Hrim and Klim’ bija mantras. On the ninth night of Navaratri, Chatsworth centre had my penultimate Talks during which I narrated the three interesting stories and their significance as contained in Sri Sri Chandi. And Navaratri concluded in a grand and unforgettable way on the Vijaya dashami night with my Talks centering around Devi Saraswati during the night satsang. You have been so kind to all of us that you almost took us all with you on this DURGA PUJA EXCURSION IN SOUTH AFRICA!!!! I could feel the actual presence of myself in South Africa sitting 1000s of miles away in India. Can we also have those 3 stories which you narrated from Chandi during your talk in Chatsworth, please. on behalf of Devotees of Holy Trio. My prostrations before Master, Holy Mother, Swamiji and revered Maharaj ! Thanks once more for the wonderful posts on your blog. They are so captivating and inspiring. I simply wait for the reminder of your next post. I want to also say that this year was the most spiritually elevating navarathrie I experienced. For the first time I witnessed the last day Vijaya Dasami @ HQ. The vibrations and energy was heavenly. Swamiji, I only learnt of your birthday from the blog. I am sad that I did not know of it earlier but I take this opportunity to wish you a happy belated birthday. May Master, Holy Mother and Swamiji bless and protect you always. I too request you to please narrate those 3 stories that you have shared with the devotees. I am sure that we too will learn some good lessons and will simultaneously accrue our knowledge if you please share them with us. Thanks for posting an insightful account of your visit to the Northern Natal during the Navrathri celebrations. I unfortunately missed the talk that you delivered on the meaning of the “Aim, Hrim, Klim” bija mantra. I have read that this mantra is so powerful and if recited daily, it has so many benefits especially for females and also helps in raising one’s self-confidence, boldness etc. Swamiji, please enlighten us a little more on the meaning of the sacred mantra. Dont forget to give me feedback either there itself or by separate mail. I would like to know how the reception is at your end. May Durga’s blessings make you manifest your divinity! Like a lotus flower, Revered Maharaj spreads the spiritual fragrance of Divinity thereby weaving a thread of harmony amongst eager devotees and families. It is so wonderful to see the dazzling pictures of Mother’s murthis in all the Centres! Thanking Maharaji for sharing his interesting, spiritual journey with all. Its great joy to see the website. I am from Gujarat and didn’t have much interaction with RK family until I was in college when I got, somehow, hold of Swamiji’s Yoga. My life has changed since then. My beautiful memories are of Vedanta Society in Dallas, which by Thakur’s grace, I was one of the founding members. 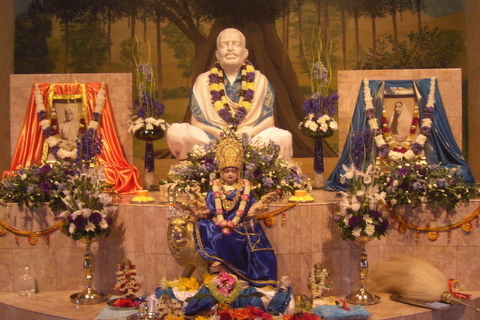 Anyway I have moved close to Boston now and hope to be a part of Vedanta family here under Swami Tyaganandaji. I follow websites of numerous centers all over the world..the growth of Vedanta center in South Africa is amazing. Who knows how Thakur-Ma-Swamiji works! My many salutes at your feet and heartly prayer that Thakur makes Himself available through you to millions in Africa and also may there be thousands like Your Holiness, so that spiritually struggling people like myself get more light in their life. if possible I wish to meet you and take Charan Raj!! We are greatly honoured and privileged to be at your Holy Feet. At every meeting with you we feel so blessed and spiritually fulfilled. We have learnt so much from Swamijee’s talks. Our firm favourite is the Gospel classes held at our Ashram. Thank you Swamijee for enlightening our lives. Pranams and a belated Birth Day Greetings. It was a lively report on the Navarathri Celebrations and you have truly presented the spirit of Durga Puja to the people of South Africa.At Chennai we had the usual way of celebrating Navarathri with Dolls on stepped platforms ( Kolu ).There is no practice of Durga Immersion in rivers in South India and I used to wonder why we are not following this practice. I got the answer from your posting of the quotation from Respected Swami Vijnananandaji maharaj. Yes it is important we have to immerse the Mother in our hearts only. I am happy that these postings and their contents are enriching many lives across the world. I pray at holy feet of the Mother to guide us in all our activities. This blog is one of the best seen, it has got well structured and details of all the functions of South Africa Mission. I wish other maharaj jis from other centers also do the same. This way all the Mission centres across globally will be well connected. Otherwise we devotees wouldn’t know where and what other types of seva are being done. I was with Swami Gokulanandaji maharaj in Delhi and I moved to Bangalore for someime. 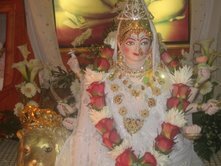 PS: Jai Durga, Jai Maa, Jai Thakur, Jai Swamiji. Many thanks for your words of appreciation! Happy to know that you were connected with late Revered Gokulanandaji maharaj. I had close interaction with him when I was in Arunachal Pradesh in the eighties. Aside the Blog model, most of our Centres in India and abroad have their own websites which can be easily accessed to. Or one can visit the Belur Math website also where when you click the branches, you are given a bird’s eye-view of the activities of the respective centre. May Master be with you!